Rex ran and hid behind a tree. "Burt will never find me here. Hee hee." Rex didn't see that his blue-green tail stuck out from behind it. Gus flew behind a rock to hide. "Burt will never ever find me here." What Gus didn't know was that his pink wings poked up above the rock. Burt shouted, "Here I come to find you." Gus giggled. "He won't find me." Rex chuckled, "He can look for an hour and not find me. Hee hee." Just then Burt touched Rex on the tail. "I found you, Rex. You are hiding behind the tree." Rex's chin dropped. "How? What?" Burt saw Gus's pink wings and ran over to look behind the rock. "I see you, Gus. You're hiding behind this rock." Both Rex and Gus ran over to Burt. His orange skin was covered with green dots. Burt said, "The next time you hide, you should find someplace better. I saw you both. Now, It's my turn to hide while Rex counts. Come on Gus." Gus and Burt ran to hide. Gus was going to hide behind another rock. Burt said, "Nuh uh. It's too small. He'll find you. Follow me." Gus and Burt ran and hid behind a hill. 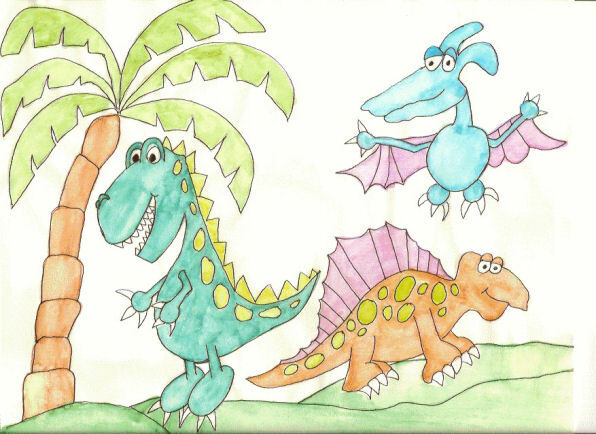 When Rex finished counting, he went to look for his friends. He ran and looked behind the trees. Nobody was hiding there. He ran to look behind the rocks. Nobody was hiding there either. Rex looked in all the caves, on top of the lava flow and even ran down to the beach. Nobody was hiding in any of those places. Rex didn't know where else he could look, so he sat down on the sand and cried. Burt and Gus giggled and then ran up to Rex. "Boo!" Gus shouted, scaring Rex. "Don't cry, Rex. Next time just listen to me and you can hide in the best places," Burt said. And he did.